Ottoman çeşme (water fountain), Kasım Paşa quarter, Istanbul, 2013. Fuji x100. Click to enlarge. 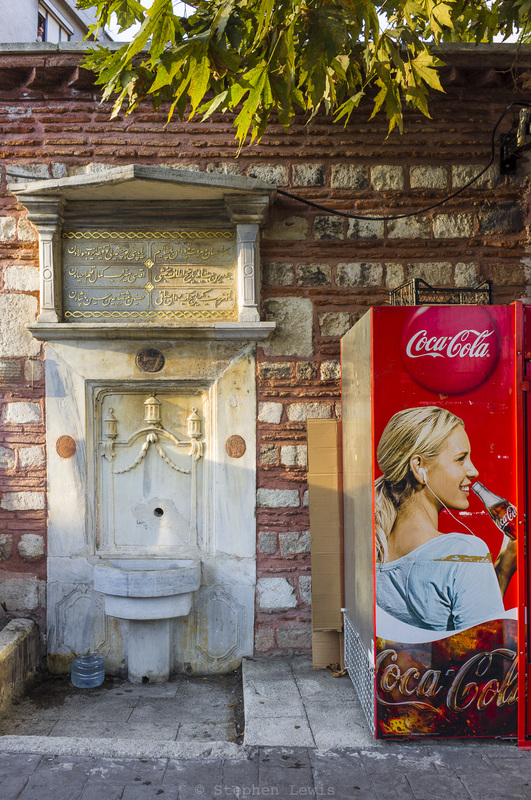 In the Kasım Paşa neighborhood of Istanbul, near to the shoreline of the Golden Horn: A simple çeşme (water fountain) flanked by a beverage dispenser so ubiquitous and recognizable that it requires no explanation. The pattern of the relief on the marble face of the çeşme and the columns to the left and right of the inscription above it, lead me to the very amateur guess that the çeşme dates from the late-18th century. (The oddly perpendicular entablature appears to be a later impromptu addition or repair.) In a no less amateur way, I would date the Coca-Cola machine at the right of the image to the late-20th or early-21st century. As to the development and worldwide availability and popularity of Coca-Cola: This is a long story in and of itself, best saved for treatment in a another context. Very cool pic! Are you on Instagram? Thanks Diane! Actually, so far, I hadn’t considered Instagram. Do you advise it? (A longer response will follow by email in a few days).